Walking boots are a must for campers visiting our Glencoe Club campsite. Surrounded by National Trust for Scotland managed woodland, this is wonderful walking country. 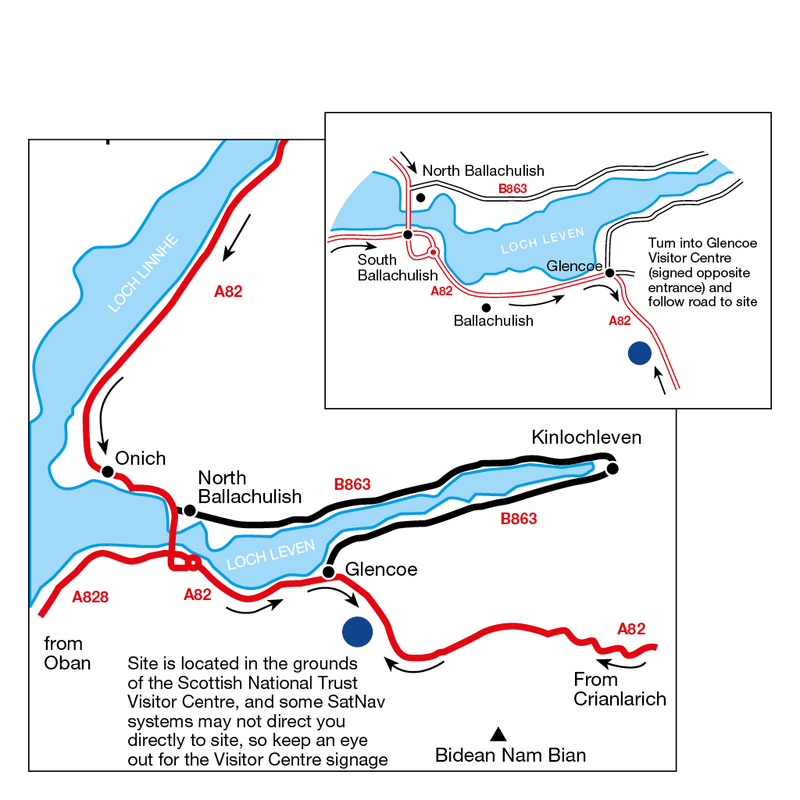 The West Highland Way passes within nine miles of the campsite and there are many other low and high-level walks. You can even bag yourself a Munro or two – there are eight within the vicinity of the site. Whichever of the 100 pitches you choose at Glencoe, you’re guaranteed stunning views of the surrounding mountains. The facilities are excellent and include a laundry, locker room and drying shed. The eco-friendly Glencoe National Trust for Scotland Visitor Centre is a short walk from the campsite. It has interactive displays, a shop and a café. In nearby Glencoe the Glencoe and North Lorn Folk Museum gives an interesting insight into the history of the area. Glencoe Activities in Ballachulish offers a choice of 20 activities and tours – from golf and canyoning to rib and Segway tours. More relaxing pursuits include a ferry ride across Loch Linnhe or embark on what’s regarded to be one of the greatest railway journey’s in the world from Fort William on the Jacobite steam train. Caravans, motorhomes and trailer tents will be booked onto hardstanding pitches. Club Standard Pitches are for tents only. No digital TV reception so satellite dish and receiver recommended. Please do not arrive on site before 1pm due to restricted access to site. The Clachaig Inn in Glencoe, the Laroch Bar in Ballachulish and the Seafood Café in Lochleven all serve good food using local ingredients. Nearby Glencoe Gathering and Glencoe Café are worth a visit. Located in traditional 18th century cottages, the Glencoe Folk Museum takes you on a tour through the history of Glencoe, the Highlands and its people. Glenfinnan Viaduct became a tourist hotspot after it was featured in the Harry Potter franchise as the railway on which the Hogwarts Express rides. On the shores of Loch Shiel lies Glenfinnan Monument, a tribute to the men who fought and died in the Jacobite cause.